In this current whiskey craze we’re living through, it’s hard to find a well-aged straight rye whiskey. If you’re lucky enough to run into a bottle at a store, the price tag will most likely give you a heart attack. At the very least, your wallet will give you the cold shoulder for a while. Enter The Cooper Spirits Company. A couple of years back they released the 13-year-old Lock, Stock, and Barrel Rye for just over $100. A 16-year-old sibling of hit shelves last year at a slightly higher price. For 2017, Cooper Spirits Co. has unveiled Hochstadter’s Family Reserve, a cask-strength (123.8 proof), 16-year-old rye. All of it is sourced from Alberta Distillers Limited in Canada, and it’s distilled from a 100% rye mash bill. 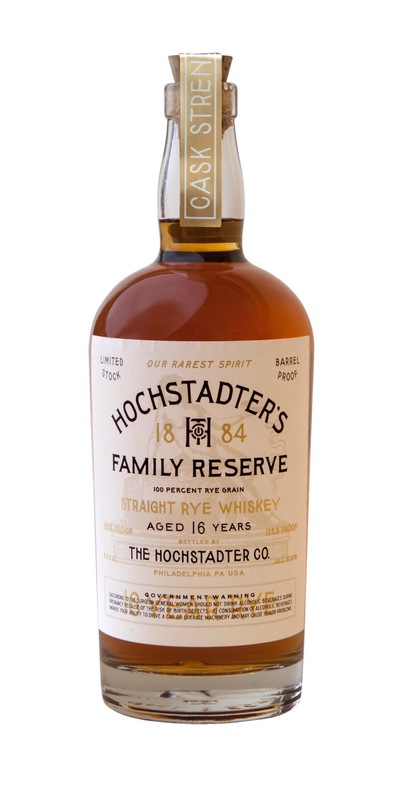 Like the other two ryes I mentioned earlier, Hochstadter’s Family Reserve is a limited edition. Only 7,500 bottles have hit the market for a suggested retail price of $199. Don’t be turned off because this whiskey was distilled in Canada. The bold nose explodes with hints of dark caramel, nutmeg & cloves, buttered rye bread, and cigar box. Some burnt orange peel shows itself with some airtime. Air helps this whiskey. It’s a bit closed off at first. The all rye grain mash bill shows on the palate. An initial burst of rye spice hits and quickly calms, allowing other notes to shine – spice cake, dark caramel, and a touch of red fruit. Mid-palate is where aged tobacco leaf and some oak spice and tannin start to develop. The finish is long and warm with nice citrus and spiced honey notes. Barrel strength whiskey is something I always look forward to tasting. Even though many are batched together (versus a single barrel release), it’s like tasting straight from the barrel. No dilution is taking place before bottling. The robust quality from these bottlings is something you don’t get from a standard whiskey release. One of my favorites is Elijah Craig Barrel Proof (ECBP) from Heaven Hill Distillery. This 12-year-old batched bourbon is offered several times a year. Starting with this first batch of 2017, Elijah Craig Barrel Proof is introducing batch numbers (sort of like Booker’s has been doing the past couple of years). It was a fantastic idea for Booker’s, and I’m sure ECBP will experience some success from it. The batch code breaks down like this: The first letter signifies the release batch of the year, while the numbers indicate the month and year of release. So, A117 = the first batch of the year, released in January 2017. The new batch numbering system will make it easier to track down which batch is which. Elijah Craig Barrel Proof batch A117 comes in at 127 proof. While not the strongest batch I’ve seen by any stretch, 127 is still a high proof. Let’s get to the tasting notes. Dark brown sugar and molasses burst out of the glass, alongside touches of anise, vanilla and oak. On the palate, this oily whiskey features hints of caramel corn, vanilla, tobacco leaf, and oak spices. A splash of water brings out more oak. The long finish warms the chest (perfect for winter), leaving behind lingering spiced caramel and slightly drying oak.